About Us - Top of Georgia is an economic development initiative that serves as a nonprofit fundraising arm to enhance the marketing efforts of the publicly funded Northwest Georgia Joint Development Authority (NWGAJDA). We serve as a way for private individuals or companies to contribute to the economic well-being of the greater Northwest Georgia area including Catoosa, Chattooga, Dade and Walker counties. 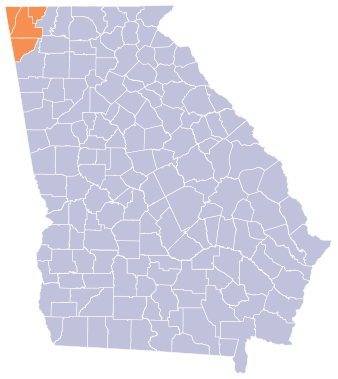 Top of Georgia applied for and received its 501(c)(3) status in 2012 and became a certified nonprofit corporation. This allows private companies and individuals to make tax deductible charitable contributions to help further the economic development efforts of their community. The nonprofit status allows for an aggressive fundraising campaign. As a result, the Partners in Progress Campaign engages the local business communities of Northwest Georgia and Chattanooga in the economic prosperity of the Northwest Georgia Area. We are able increase the amount of funds available for our economic development efforts and start a broader conversation about what economic development looks like for our region and where we want to head in the future. We have many investors ranging from small companies to large corporations and individuals. The size of an investor's contribution is not as important as the interest they have taken in the economic welfare of our community and we thank each and every investor for their foresight and commitment to our community.